On June 30, 2003, me and Pol are leaving home, for a nice meeting with the other Europrezzes. Wednesday we will either do Stelvio, or will visit Market 2Ruote in Castelfranco Veneto for some... shopping! Thursday July 3, will be a long riding day, since we will have practically to ride all through Switzerland from east to west, then into France to Mulhouse, and another 100 or so km's to Rouge Gazon. 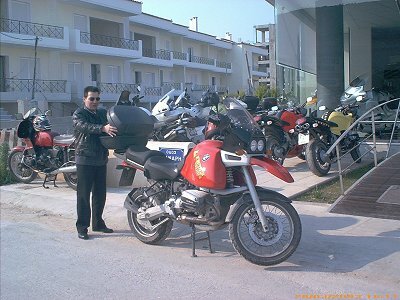 While me and Pol will ride each alone on our BMW R1100GS's, my wife Ophelia will join us on Friday sometime. She will fly to Zurich, then will catch a train to Mulhouse, where I will wait for her, and ride with her the last 40-50 km to Rouge Gazon. She will fly back on Monday morning, while we will leave too, heading south, hopefully doing the four passes in Switzerland, Susten, Furka, San Gottard and Oberalp, on the way to Italy. The full report starts here! Rouge Gazon, where the meeting is taking place. My earlier travels... (while this very page will take some 15 days to get updated!! !